Made in E.C. only denotes it was made in a European country. 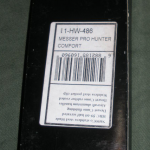 This strange colored Mannlicher marked Pro Hunter Comfort knife was sold by Steyr Arms in the United States and Steyr-Mannlicher in Europe (product code 1-HW-486). 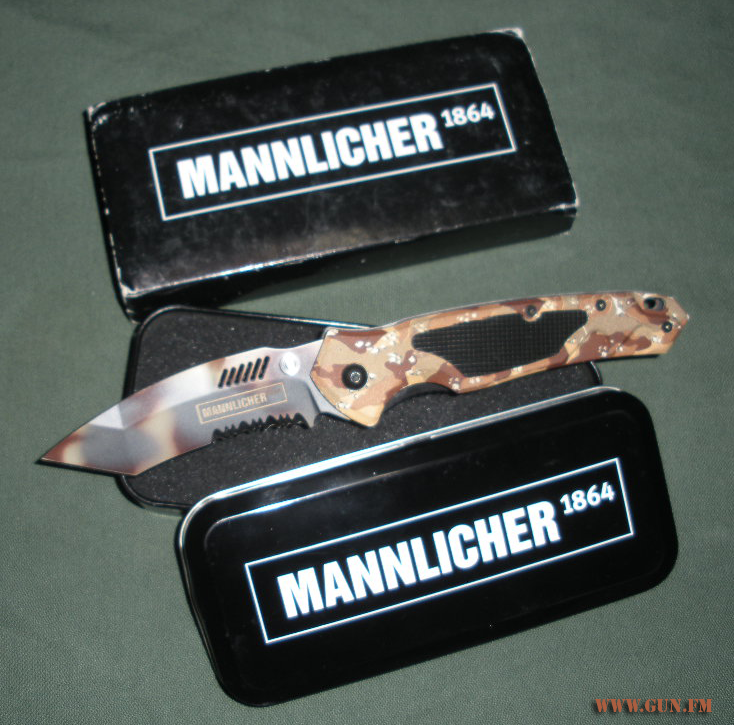 The blade is a N690 stainless with a hardness of 59-60HRC. 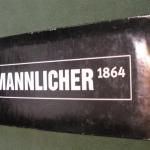 The N690 cobalt stainless steel is made by Bohler in Austria and is comparable to the Japanese VG10. I consider it a slightly better steel than 440C; comparing it to 440c – N690 takes a little longer to give an edge. 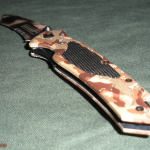 The tanto blade comes half-serrated. 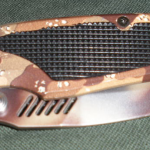 The “Comfort” series has aluminum handles (labeled as “aircraft grade”), with rubber coated inlays in a desert camo pattern. This is the six color USA pattern most associated with the Persian Gulf war. 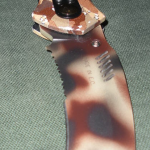 The blended spray-paint style teflon desert camo finish of the blade, is an entirely different disruptive pattern which gives the knife an even more unique look. 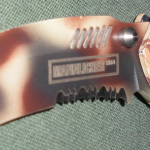 This is one of the smoothest opening knives I’ve owned; it has a much nicer mechanism than the SIGTAC knives by Fox knives, the AK Kalashnikov folders from Boker and the H&K comparatively priced knives by Benchmade (I have not tested the top-end). This is only an overview as I don’t plan to put this knife through daily carry or any serious testing. 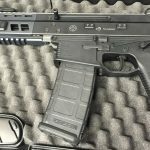 Sig Arms, Inc has confirmed the knife is discontinued, at least for USA sales. 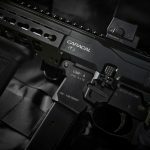 In the United States this blade sold for $118 by Steyr Arms and can still be found in the Czech Republic for about $47 US. The cheapest price I found in Austria or Germany was just over $81 USD. 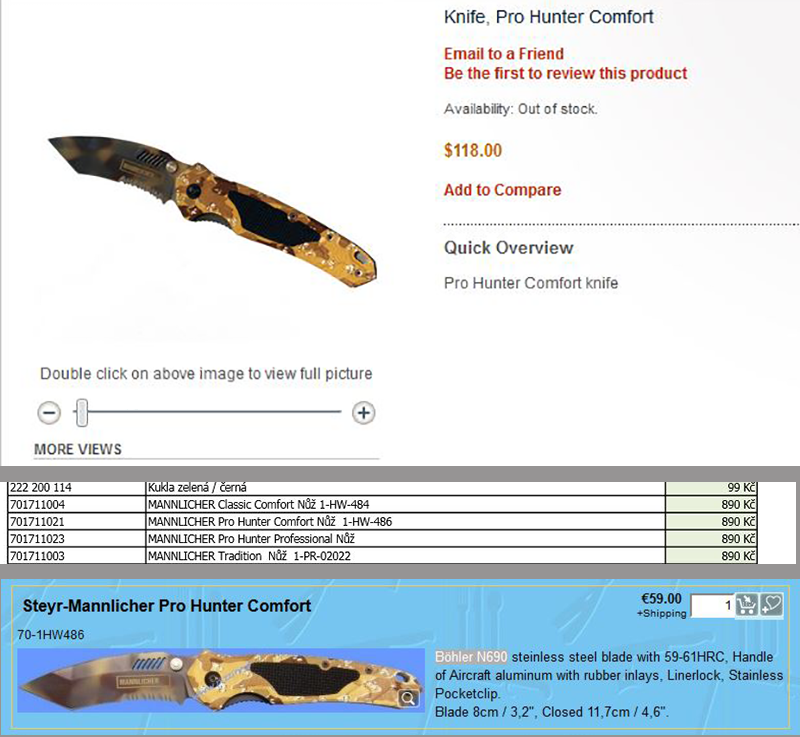 Brand new or like new knives have sold for well over MSRP but it may be cheaper to order one online and pay the shipping. 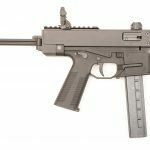 Steyr’s current knife selection can be seen on their website. Screenshots of prices around the internet.